TO RECOVER ALL ENGLISH 7ft. (SIZE = 80" x 44"). 6 x STRACHANS CUSHION STRIPS. CHOOSE FROM GREEN, RED, BLUE, BLACK, BURGUNDY OR PURPLE? IF NOT STATED GREEN WILL BE SENT. We can also send you Nylon Speed - No nap cloth in the above colors in this kit if you prefer rather then the Strachans Wool. Please let us know at the time of ordering? 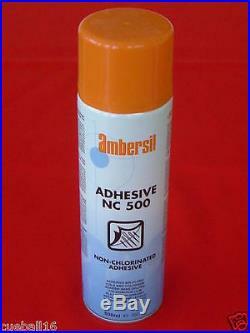 TIN OF 500ml AMBERSIL CLOTH ADHESIVE. D MARKER with MARKER PEN. BOX OF 12 CHALK TO MATCH YOUR CLOTH. PLEASE NOTE A 7x4 FOOT TABLE IS THE EXTERNAL SIZE OF THE TABLE. PLEASE CHECK YOUR SLATE SIZE BEFORE ORDERING THIS KIT. 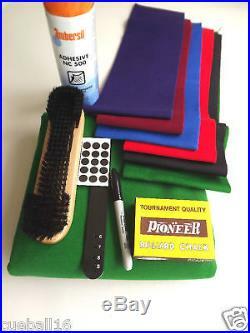 The item "7x4 POOL TABLE RECOVERING CLOTH / SERVICE KIT FOR 7ft-7x4 ENGLISH POOL TABLES" is in sale since Friday, March 22, 2013. This item is in the category "Sporting Goods\Snooker & Pool\Table Covers". The seller is "cueball16" and is located in Preston. This item can be shipped to United Kingdom.